So about a week ago, Neil Patel, one of the most well-known SEO ‘s in our industry declared that he didn’t think to produce large amounts of content would benefit his site anymore and shared some interesting insights. Late last year, he acquired a free keyword tool used by many SEO’s called Ubersuggest that yielded a lot of traffic to his website. When he added a new set of features, the traffic grew even more, and that’s what gave him the idea of adding more functions for increased traffic. Neil underestimates the server costs and infrastructure needed to grow such a tool. Even if they manage it, they won’t have historical data people rely on at the beginning. Neil probably has a hidden plan to release a paid version of this tool. The version released will probably be much less ambitious than the paid tools. This splits the SEO Community in 2, those who think Neil is Robin Hood, and those who are not happy to see data being free and opened to everyone. This could be an amazing bluff to buy a B player tool and lower their valuation (Probably KWFinder or SERPstat). This could be a Buzzsumo type launch where the tool is free for a while then he adds paid options to monetise. If no login is required, someone will build scrapers and destroy Neil’s server costs. He may be planning to use the data people are tracking somehow and crowdsource data collection. This may compel companies to develop better features to maintain their premium. If everyone has the data, content quality and hustle will be the key differentiating factor. What do you think this free tool means for the industry? Let us know in the comments! Honestly, I really admire Neil for this, just purely from an entrepreneurial standpoint, the guy has some guts and takes some serious risk, which is what it takes to be a great entrepreneur. Once again, he’s managed to get everyone talking about him. He has the money and he’s going to do some aggressive acquisitions in the future no doubt, it’s always how he stays ahead of a lot of people. He likes to go bigger and crazier than his competition, to the point where they get exhausted even thinking about trying to compete with him. He did it with his ultimate guides on Quicksprout. Spent as much as $30,000 on each of those guides, some in the SEO community thought that was crazy and that paid off big time for him. He’s never been shy about chucking obscene amounts of money around to compete. Honestly, I think he’ll pull it off and the SAAS companies will need to raise the bar again. I just cancelled my recurring subscription for Serpstat. Neil is the Alexander of the SEO world. There are many examples of companies that lied around on their success for years and went to bankruptcy … i remember quite well about Blackberry and Nokia , they dominated completely and then crashed. I lke what Neil offers in terms of free content and he told 2019 will be the year of offering free services… of course he also claimed that we will try to sell services or consultancy for who requires. But what he really wants to achieve is to double his traffic to 3.6-3,7 Million pageviews per month and consequently will sell more stuff that he has to sell (whatever it is). So he will offer free services (like ubbersuggest that has been quite upgraded) in return. If this strategy will work or not, i dont know. To me this is the market moving and the competition needs to adapt and offer even more premium services. I dont see it as a bad thing, for many will be good since they will have access to services that were not free at all. No news about this service which Neil Patel wanted to release. Anyone has any sort of information ? Even if it does happen and it remains free for most people it will be information overload ,for some. 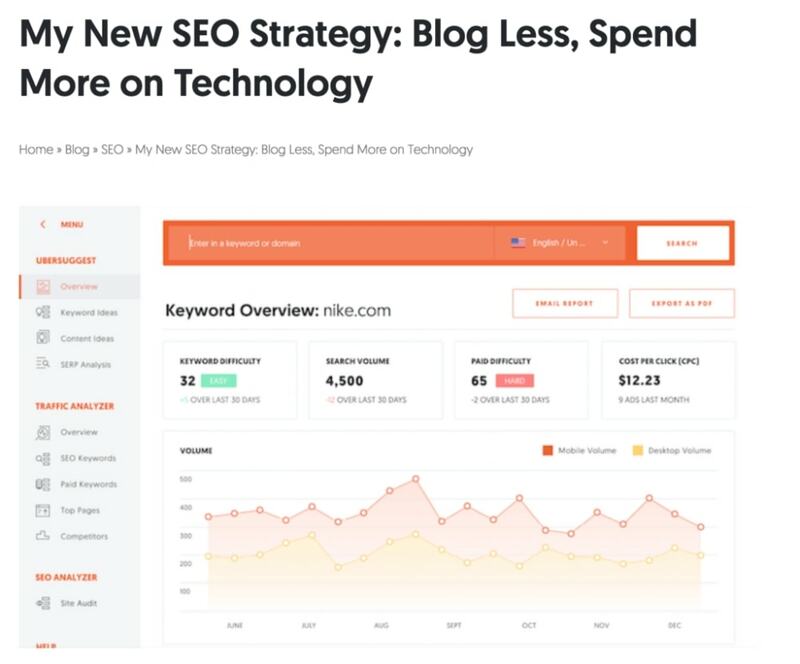 I am sure the big SEO agencies will still make money from implementing SEO tactics, perhaps not from the old recurring revenue model unless they can re-invest what they already have and come up with the next level of SEO tools. I welcome any free tool that is available anytime. If Neil Patel plans to keep the tool free, kudos to him. No, we are not going to get it for free. For sure, it will have a cost. Agreed with most of the opinion. Well, I have been impressed by Niel’s work. Even I am not able to digest the possibility of such tool being free. However, I have developed trust for Niel and so I am keeping my fingers crossed.